Congratulations on taking time to learn more about the science behind Sonic Vitamins! Each of the Sonic Vitamin recordings use special sounds to shift your brainwave patterns, and help bring about certain states of mind - for example, relaxation, or creativity. On this page, we'll look at why this happens, and the science behind it. For example, if you're in a state of deep focus, your brainwaves are likely to be in the Alpha frequency range of 8-12Hz. 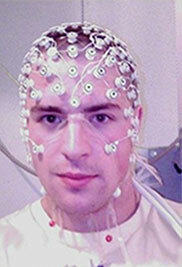 These frequencies can be measured using powerful scientific tools, such as an EEG (electroencephalograph) machine. In the 1950s, scientists discovered a method of actually changing these brainwave states on demand, using a powerful process known as "brainwave entrainment." They realized that brainwaves "entrain" (or follow) external frequencies. The problem was that the human ear can only hear frequencies of around 20Hz to 20,000Hz - whereas the vast majority of useful human brainwave frequencies (ie, deep focus at 8-12Hz) are in the range of 0.1Hz to 20Hz. That's when scientists did something really clever. They decided to play one frequency into the left ear (ie, 400Hz), and another into the right ear (ie, 410Hz). The noises cancelled each other out and recreated the difference inside the brain (ie, 10Hz). The brain then followed (or entrained toward) this frequency, which in turn brought about a specific state of mind - such as deep focus. This was the birth of "binaural beats," one of the first true brainwave entrainment methods, originally suggested in the 1830s - and scientifically verified by EEG machines in the 1950s. Since then, other methods of brainwave entrainment have been discovered. Binaural beats remain the most well-known. The most powerful technique is the use of isochronic tones, which use tiny audio pulses to entrain the brain. Every single Sonic Vitamin session combines both of these powerful methods - binaural beats and isochronic tones - to create a dynamic listening experience that delivers optimum results. Since the 1950s, and with the advent of the latest, sophisticated 2019 computer technology, brainwave entrainment recordings have made significant moves forward. Further brainwave research has led scientists to uncover the exact brainwave "signatures" for states such as sharp focus, reinvigorating sleep, mood improvement, increased energy, and more. Advances in computer technology have also enabled scientists to more accurately create the precise pulses required for effective isochronic tones, as well as to more closely monitor the results of brainwave entrainment sessions. Sonic Vitamins stands at the forefront of that technology, producing useful 30-minute "audio pills" for bringing about specific states of mind, on-demand. For deep sleep, lucid dreaming, increased immune functions, you need a frequency of between 1-3 Hz, producing Delta waves. For deep relaxation, meditation, increased memory, focus, 4-7 Hz stimulates Theta waves. For light relaxation, super-learning, positive thinking, Alpha waves at 8-12 Hz will do the trick. For normal states of alertness, stress, anxiety, you need to activate your Beta waves at 13-25 Hz. A 30-minute session at 5 Hz can replace around 2 to 3 hours worth of sleep. Accelerated learning can take place at between 7 and 9 Hz. Insomnia can be relieved with 10 minutes at 4-6 Hz, 20-30 minutes below 3.5 Hz, finishing and fading out on 2.5 Hz. Each of the Sonic Vitamins recordings has been professionally produced to the very highest standards. They make use of the latest brainwave technology to help you reach states of mind you might never otherwise achieve. They’re the 21st century solution to accessing your inner power, releasing your potential and realizing your goals – just by listening! Ready to learn more? You can download and read our full user guide by clicking here. You can also read our extended science guide online, starting with "The Science Behind the Sounds." Just got a few questions? Try our Sonic Vitamins FAQ. FDA Disclaimer: The statements made on our website(s) have not been evaluated by the FDA (U.S. Food & Drug Administration). Our products are not intended to diagnose, cure or prevent any disease. If a condition persists, please contact your physician. The information provided by this website or this company is not a substitute for a face-to-face consultation with your physician, and should not be construed as individual medical advice. The testimonials on this website are individual cases and do not guarantee that you will get the same results. Sonic Vitamin MP3 recordings should NOT be listened to by people with epilepsy. Click here to read our full disclaimer.